At CRGH we are pleased to be able to offer you the most accurate form of Down syndrome screening, in the form of the Non-Invasive Prenatal Test (NIPT). A non-invasive prenatal test (NIPT) analyses the DNA circulating in the pregnant mother’s blood from 10 weeks gestation. There are two tests available; Basic (also known as NACE) and Extended. For more information on both tests please download our guides below. It can be performed from the 10th week of pregnancy, and is a blood test which does not pose any risk to the pregnancy. The test starts with an ultrasound scan to confirm the dates of the pregnancy and presence of a foetal heartbeat. It is a new option in prenatal screening for Down syndrome (trisomy 21), Edwards syndrome (trisomy 18 ), Patau’s Syndrome (trisomy 13) and also common chromosomal conditions associated with X and Y chromosome . 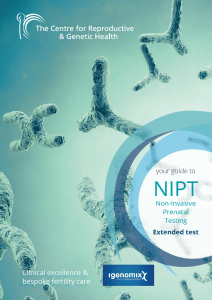 An NIPT test can be requested for any singleton or twin pregnancies, including in vitro fertilisation (IVF) pregnancies with egg donors.However, in the twin pregnancies the chromosomal conditions associated with X and Y chromosomes cannot be screened. The NIPT Test is now the most accurate non invasive screening for the most common aneuploidies. Abnormalities in individual genes are not detectable. If you have a personal or family history of a specific genetic condition, please book a consultation with our Genetic Counsellor before proceeding with any tests. Results take 10 working days. For more information please contact us on +44 (0)20 7837 2905 or info@crgh.co uk.